With the exception of a few artists, modern country has taken a hard left turn for the worse over the past two decades. Ask some people, and they might even say country’s become a shell of its former self. Sturgill Simpson is not one of those people—mostly because he doesn’t seem to care what is happening within the confines of the country music world. Instead the Kentucky-born singer looks to more far-out places on his second full-length, Metamodern Sounds In Country Music. 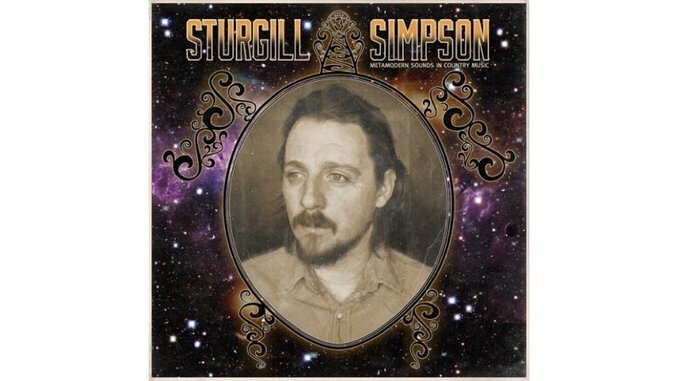 One of the first things you’ll notice is Simpson’s voice, which conjures the ghost of Waylon Jennings. In fact, that’s how I discovered him. I was walking outside a small venue at Portland’s Pickathon music festival last summer, and Simpson’s burly baritone stopped me in my tracks. Once I saw the stripped-down trio—Simpson on acoustic guitar, Kevin Black on electric bass and drummer Miles Miller—I was immediately on board with their classic leanings, but also with how unforced and real it sounded. Those same musicians, with the addition of spitfire guitarist Laur Joamets, are the building blocks for this collection. But Metamodern Sounds In Country Music expands on their live performances with the help of producer Dave Cobb, who recorded Simpson’s excellent 2013 debut, High Top Mountain. This time around the songs owe as much to Carl Sagan as they do Merle Haggard, most notably on the almost seven-minute “It Ain’t All Flowers,” which takes ’70s outlaw country on a sizzling acid trip. Chemicals have their place on this record. “Every time I take a look inside that old and fabled book/I’m blinded and reminded of the pain caused by some old man in the sky/Marijuana, LSD, psilocybin, DMT, they all changed the way I see/But love’s the only thing that’s ever saved my life,” Simpson sings on opener “Turtles All the Way Down,” a song inspired by psychiatrist and psychedelic drug proponent Rick Strassman. Simpson finds balance on the barroom crawl of “Living the Dream” and “Life of Sin,” which yanks a page from the Bakersfield Sound songbook. He even manages to turn When In Rome’s 1988 one-hit wonder “The Promise” into a tender (and barely recognizable) ballad. You won’t hear any pedal steel this time around, but you will hear mellotron on “Just Let Go.” Those touches are noticeable, but Cobb’s warm production can’t be overstated—it holds the entire thing together and also makes Metamodern Sounds a shelf-worthy addition next to the greats. If you don’t like country music, don’t bother. But if you do have an ear for Waylon and Willie and the boys, then you’ll find plenty to love. Simpson may reside in Nashville these days, but he’s operating on a completely different plane. Here’s hoping his own mind-expanding experiments will expand the minds of listeners as well.